Okay everyone, as the heat wanes it’s time to get refocused on Architecture and Design, and short trips and simple travels are always a great way to do it. One trip I highly recommend you take right now is a run over to Los Angeles to the Hammer Museum in Westwood to bask in the new exhibition. Between Earth and Heaven: The Architecture of John Lautner is on view now through October 12th and should not be missed. We saw the show this summer and highly recommend viewing it! Lautner’s career is wonderfully presented with a wealth of drawings, slides, models and photographs. It’s great to track this Architects career from his youth and early days at Taliesin West, all the way through to the highly expressive designs that came later in his career. We’ve had the good fortune to tour several of his homes and what a treat that was. This month and next, there are tours held in conjunction with this show that are available for you to attend so if you can sneak away, you should definitely go! We loved the Reiner/Burchill Residence – also known as Silvertop. Having seen images before, I was expecting to be “wowed”. We were not expecting such a dynamic space or as interesting detail as we came to discover in this house in person. It’s a remarkable place, sweeping and intimate at the same time. We also enjoyed the geometric simplicity and thoughtful, née DEDICATED, restoration of the Harpel House It took current owner Mark Haddawy two years to get it back to the architect’s original design and we saw it about 80% complete. I found it a joy to look at the connections and construction methods, plus Lautner’s Chemosphere as a neighbor. 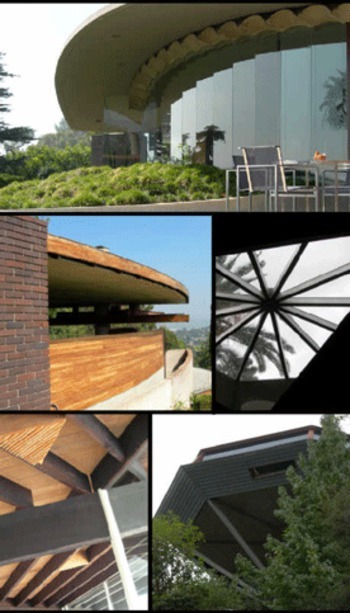 The MAK Center for Art and Architecture at the Schindler House is one of our favorite institutions and this year they have partnered the presentation of its 2008 Architecture Tours in with the Hammer Museum and the work of John Lautner. These tours always provide a rare chance to experience great architecture, but this year’s a remarkable opportunity. Here’s the line up” Tour II: Sunday, September 14, 2008 includes The Jacobsen Residence (1947), The Harvey Residence (1950), and The Reiner/Burchill Residence – (a.k.a. “Silvertop” 1963). Tickets for Tour II are $145 per person, per tour. Tickets include admission to the exhibition, shuttle service, and discounted parking at the Hammer. To purchase tickets for Tour II, you must be a member of the Hammer Museum at the Contributor level or above. And as a special Lautner Tour benefit, when you sign up for Hammer membership you will automatically receive MAK Center Active-level friendship at no additional charge. Up to four (4) tickets can be purchased per tour, per membership. Not inexpensive, but well worth it! Next month you can attend Tour IV: on Sunday, October 12, 2008. This features the Sheats/Goldstein House (1963) only. Tickets for Tour IV are $55 per person, and include admission to the exhibition, shuttle service, and discounted parking at the Hammer.